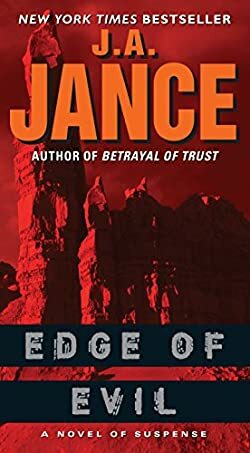 JA Jance / Judith Ann Jance is an American author who wrote several of mystery and thriller series, including the J.P. Beaumont series, the Joanna Brady series, the Ali Reynolds series and the Walker Family series. Here is the list of the JA Jance books in order for each of the series the author has written. JA Jance was born in Watertown, South Dakota. As a child, she moved with her family to Bisbee, Arizona, where she was raised. In 1962 she graduated from Bisbee High School, from where she received a scholarship allowing her to attend the University of Arizona. She graduated from here in 1966 with a degree in English and Secondary Education. Before starting her writing career, JA Jance had several jobs, including that of being school librarian on a Native American reservation, a teacher, and an insurance salesperson. It was during her time of selling insurance that she started to write, in the middle of the night, as her day job and her kids wouldn’t give her much time to write during the day. Talk about ambition – which thankfully helped her push on so that she could finally realize her dream of a full-time writer – of successful books, nonetheless. An interesting fact is that the JA Jance Joanna Brady series is taking place in Arizona, the very place where the author grew up. show just how much she has learned over the years – and learned to put that experience to good use. I would dare to think that writing these books was also a cleansing experience for the author. Kudos to her. The JA Jance books list currently includes 24 novels in the J.P. Beaumont series, 17 novels in the Joanna Brady series, 14 in the Ali Reynolds series, 5 in the Walker Family series, not to mention all the novellas the author wrote in each of these series. Then JA Jance also wrote a book on poetry and several short stories. While the order of the books by JA Jance is pretty clear, you do need to pay attention to the fact that some of the books intersect between the various series (e.g. Partner in Crime is book #16 in the J.P. Beaumont series and #10 in the Joanna Brady series). Whenever such a crossover happens, I will mention it in brackets next to the relevant book. To read the JA Jance books, I suggest you read them in order. As I mentioned above, the various series will cross at some point, and it’s interesting to follow the main characters interacting with each other to solve various crimes. Her latest book in the Joanna Brady series is published in 2017 with the title Field of Bones. 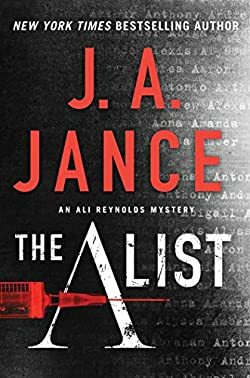 A new book in the Ali Reynolds series was published in 2019 with the title The A List. The first JA Jance series was J.P. Beaumont, which was started in 1985. My favorite series, however, is the JA Jance Ali Reynolds series. I can somehow much more related to Ali’s female character than with, say Beaumont or Walker. The series started in 2006 with Edge of Evil, which was also the first book I’ve picked up in the series to read. Ali is a 40+ former TV journalist who is currently living in Sedona, Arizona. Her age greatly contributed to her being kicked out of her job since broadcasting executives wanted someone younger in her place, wanted a younger face on the TV to say the news. So Ali goes home to her husband, a famous media mogul, only to realize that he also has replaced her in his life with a much younger female version. So finally she packs her bags and goes home to Sedona to pick up the broken pieces of her life once again, not to mention to help her friend’s family after learning that one of her best friends died. I found it interesting to read about her starting her own blog. I don’t exactly remember whether in 2006 blogging was as big as it is now. 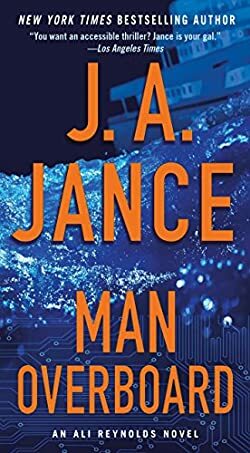 In Man Overboard, the JA Jance Ali Reynolds book #12, published in 2017, Ali is now more of an amateur private detective. She gets involved in a case where cybersecurity expert Roger McGeary falls down the balcony of a cruising yacht. The police don’t give much thought of his death, so Roger’s aunt, Julia, asks Ali, and Stuart Ramey, who is Roger’s childhood pal, to help find out what exactly happened with Roger. The serial killer who targeted Roger is after other people as well, who have lost their parents to suicide. In this book, an AI (artificial intelligence) is used, sadly, for evil. When the killer targets Stuart as well, Ali, with the help of her company, High Noon Enterprises, has to stop the killer before it is too late for Stuart. In The A List, we meet once again Ali, this time investigating a rather common theme in our modern times: the fraudulent activities of a doctor’s use of his own sperm for artificial insemination. This is a theme that has been touched upon several times ever since DNA has been used to research a person’s ancestry. Dr. Edward Gilchris used to be a rather popular doc who helped people with artificial insemination back when DNA procedures were not as known as now. It turns out that he actually used his own sperm as a donor for people without kids. What nobody knew, however, was that he has a genetic kidney defect which has been passed down to some of the children he created using his own sperm. The story is really contemporary in theme, especially since these days practically everyone can find about their own ancestry from various online places with with a small cost and effort. Looking back to the first Ali Reynolds books, it was interesting to see the author’s development of technology in her books. She initially started with Ali writing her first blog post. Now, we’re at cyberbullying, and even at sophisticated AIs and genetic manipulation.